In order to teach English Learners in California, a teacher must receive authorization from the Commission on Teacher Credentialing (CTC). This requirement is mandated through legislation in the California Education Code, sections 44253.3 and 44253.4. The purpose of the California Teacher Of English Learners (CTEL) is to insure that credentialed teachers have the necessary teaching skills needed to instruct English language learners. CTC has hired Pearson, on a contractual basis, to develop and administer the CTEL exam. Many Cross-Cultural and Academic Support type teacher credential classes are waived if you pass. Therefore, there's a lot of knowledge and real life teaching scenarios you must show you're fluent in as an educator of second language learners. You can earn a CLAD or BCLAD credential through a teacher credential program. However, if you pass the CTEL exam you will fulfill the state competency requirements taught in CLAD/BCLAD courses. Get an effective and comprehensive CTEL practice test so you don’t go in the wrong direction in your test preparation. Use high quality CTEL study guides to gain exam-like familiarity and exam practice applying the concepts acquired from reading your prep books. When registering for the CTEL exam you need to provide your social security number in addition to some background questions concerning language proficiencies, and hours of in-service training. CTEL test registration is done by internet and is available 24 hours a day, 7 days a week. Candidates are processed on a first come, first serve basis so it is important to register as early as possible to make sure you receive your preferred date as seating is limited. If you wish to take all three segments at the same time, the cost is $260. If you wish to take each CTEL test separately then Language and Language Development costs $98, Assessment and Instruction costs $147, and Culture and Inclusion costs $99. At the time of registration payment must be made in full using a VISA or MasterCard, or a debit or check card that has a credit card logo and doesn’t require a pin number. Once you have completed the online registration, you will receive an email that acknowledges that you have registered. Within one business day, you will receive another e-mail called Authorized to Test which will allow you to set up a test appointment. The Authorized to Test e-mail will provide instructions on how to set up a testing time. When you arrive at the CTEL exam center you will be asked for one piece of current, government issued identification. This can include a driver’s license, a passport, or military identification. You will not be able to take cell phones, electronic devices, calculators or any unauthorized aids into the testing area. At the beginning of the CTEL test, you will be asked to sign a nondisclosure agreement on the computer. The CSET examination has three separate components: Language and Language Development, Assessment and Instruction, Culture and Inclusion. Language and Language Development (CTEL 1), includes language use and structure, and first and second language acquisition. This segment has 50 multiple choice questions and 1 essay question. The length of the exam is 105 minutes. Assessment and Instruction (CTEL 2), includes developing appropriate assessment tools and creating appropriate content for learners. There are 60 multiple choice questions and 2 essay questions. The duration of this segment is 165 minutes. Culture and Inclusion (CTEL 3), includes understanding cultural diversity and how it relates to academic achievement. This section contains 40 multiple choice questions and one essay question. The length of this section is 90 minutes. 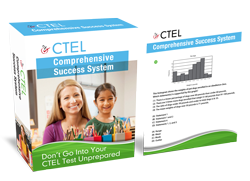 All the CTEL test components were developed through committees of California educators and other assessment experts. The CTEL exam score will be provided by CTC on the published report dates. The score will give information regarding passing or not passing for each segment, and other performance indicators. CTEL tests calculate a raw score which is then converted to a scaled score that ranges from 100-300. A minimum of 220 is needed to pass a segment. Multiple choice questions represent 70% of the final scaled score while essay questions are weighted at 30%. The multiple choice questions are tabulated by computer as correct or incorrect. There are no deductions for incorrect answers. The CTEL essay questions are reviewed by a minimum of two California educators who use a standardized rubric. The essay questions are judged primarily on their relevance to the question, the application of knowledge and the support provided. The score is compared to a pre-existing standard that has been established by the commission, rather than to other test takers. Go to: 7 Insightful CTEL Test Preparation Tips That Helped Me Pass Faster And Easier right now. After a year of anxiety and frustration—and almost $1000—I did it! I passed all 3 parts of the CTEL! I wouldn’t have been impressed, either, 18 months ago. But that was then. This is now. As a veteran teacher in another state, I was living my dream! My master’s degree in education was proof of my commitment. Then my husband’s job was transferred to California. No problem! I would love to teach in California! You guessed it: D. If only the CTEL were that easy. For me, “D” stands for Dazed, which is how I felt as I took the three parts of the CTEL the first time and realized that I was not prepared. I was always good at taking tests, so when I looked at the format of the CTEL, I figured 150 multiple choice and 4 short answers—I can do that! Added to my good test-taking skills was the experiences I have had teaching students whose first language was not English. It’s pretty easy to think the CTEL weeds out poor teachers until you’re the one weeded out! Ellie Herman, a television writer, vented her feelings about the weeding out process in an online article. 78 test-takers shared their comments, but one stood out. Why didn’t I read that before I spent three weeks studying what I thought would be on the test? Why was I embarrassed that I couldn’t pass the test the first time? I didn’t know that from 2008-2013, only 60% passed the tests the first time if they took each test one at a time. If they took all three at once, the average over those years was about 70% passing. The report noted that passing rates had gone down in that last year of the study. (Professional Services Committee Annual Report on Passing Rates of Commission-Approved Examinations from 2008-2009 to 2012-2013). The CTEL really weeds out poor test-takers. Remember the comment about the test questions being “obscure and worded confusingly”? That’s why so many test-takers feel that the test is unfair. You heard me. Learn the test itself! That’s exactly what I did. And did I mention, I passed? CTEL 1: Language and Language Development covers language structure & use & first- and second-language development & relationship to academic achievement. 50 m-c &1 essay. CTEL 2: Assessment and Instruction covers assessment of English learners, foundations of English language & literacy development & content instruction, & approaches & methods for English language development & content instruction. 60 m-c & 2 essays. CTEL 3: Culture and Inclusion covers culture and cultural diversity and their relationship to academic achievement and culturally inclusive instruction 40 m-c; 1 essay. Read any test-prep site and you will find people who swear by one test prep method or another. Instead of preaching one over another, let me guide you through all the methods. No matter which you choose, you will be better prepared than I was. Research cited: https://ies.ed.gov/ncee/wwc/PracticeGuide/1. The most talked-about book is Diaz-Rico’s A Course for Teaching English Learners. Be aware that this professor has authored other books, so make sure you have the correct title! Many CTEL takers swear by this book and this book alone! Length: 408 pages of “textbook” reading. Do you have TIME for this? The CTEL can be taken in three parts or all at one time. If you choose to take subtests separately. You will multiply the “Did I pass?” time by 3. . . So take the first step, which should NOT be to go into the test room without preparation. You got it! D, which stands for delighted, which describes you when you pass the CTEL the first time! Did you always dream of being a teacher? Did you just happen into the career? Or are you someone who is just starting the best second career ever? Becoming a teacher is thrilling. And challenging. In 2016-17 there were over 1.3 million English learners in California’s public schools. Each one of them deserves to have YOU as their teacher! Think of the excitement as you watch YOUR EL students graduate with an equal chance at success because YOU were their teacher! Over 1.332 million students who are English learners need YOU! How can you begin helping them? YOU first need to succeed, by passing the CTEL. One of the fastest ways to prepare is to go online to find prep materials specifically tailored to your needs as you prepare for the CTEL. A slower route is to take online courses that prepare you for CTEL and also help you earn CLAD. Let’s explore both options to see which one is right for YOU! Online test prep courses VARY GREATLY! some are offered by test prep companies; others by school districts (ex. LA). some offer only practice tests; others combine lectures, PowerPoints and discussions with tests. some may have your school district’s support, offering you reimbursement. Why Choose Online Test Prep Resources? You can study at any time, day or night. Activities, such as practice tests, may be done in 30 minutes or less, then saved for later. Depending upon your device, it can be easy to work anywhere. Prep time can be as little as weeks to 3 months, depending upon the program you choose. Immediate results for practice tests, both raw score and estimated CTEL score. Strong programs explain your right and wrong answers immediately. You save time by learning what is on the test without extra info. Basic costs are upfront and can range from $50-$300. Programs often offer other help such as online tutors—but there may be an extra charge. YOU must set your schedule and stick to it. YOU must be honest about the material you do NOT know and study it. If you procrastinate, these may not work for you! Putting it off can mean you wasted $$. The program may be done in small installments, but if you put it off, it adds up to HOURS. Your device must meet the technical requirements of the program: downloads can add to the cost. The flexibility of this option depends upon the reliability of your device or wi-fi. Accidents happen and devices crash—it’s good to have a Plan B for accessing the program. Searching for courses to prepare you for the CTEL and to apply for your CLAD is confusing: there are dozens of programs! In 2016 there were only 10 universities with the stamp of approval by the CCTC, or California Commission on Teacher Certification. One offers 8-week courses totaling $2100; another offers 6 courses over 5 years with a cost of $2675 + materials and application fee. AND you STILL have to take the test! Someone else creates the plan. Credits may be easily transferred between some institutions (*check BEFORE you begin). Instead of learning just to pass a test, you can learn and use best practices and strategies. You will keep materials and plans you have prepared, ready to use in a classroom setting. CLAD offers flexibility to move from one job to another within or between districts. CLAD may make you a more desirable hire due to the Global California 2030 initiative (see the initiative at https://www.cde.ca.gov/eo/in/). Programs range from $2000 to $3000; materials and application may be extra. Financial aid may be available, but applications take time to write and to process. If the coursework is rigorous enough to help you, it may consume your “free” time. The structured deadlines may create STRESS as they conflict with YOUR schedule. “The dog ate my homework” doesn’t cut it at the university level. You may get one “pass” for illness, emergency, or technology issues, but more than once and you will be on “the list” (side note: I really DID have lightning kill my computer, a death in the family and a computer malfunction all within one year’s coursework. . .). Is my goal for the short-term (pass CTEL) or long-term (achieve CLAD)? What can I afford now? Can my district reimburse me? Is it worth spending more now to get higher wages or more career flexibility? (If you are already teaching) Does my school district recommend one program? What do others recommend? Ask teachers or look online at testimonials. Remember: choosing simply to pass the CTEL now does NOT block your future path to CLAD. Passing all three parts of the CTEL means that YOU can be the teacher that motivates English learners to meet the challenges they face. Your efforts now will affect those students for the rest of their lives!